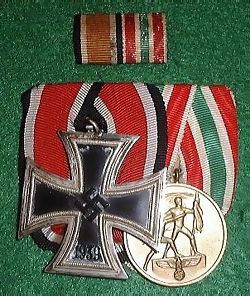 The rarest of all the so called flower wars medals is the Memel Medal. 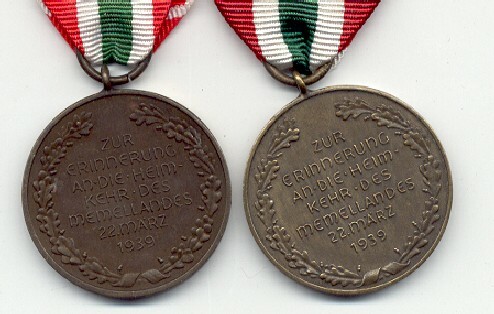 There are some very good copies of these medals in circulation so it pays (as always with Third Reich) to be extra vigilant when buying these awards. 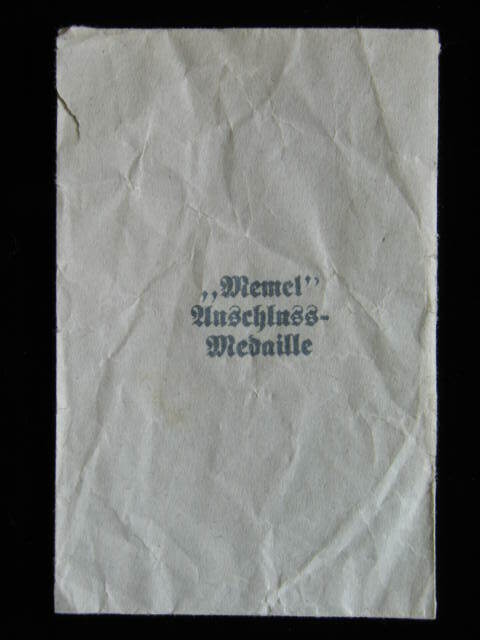 However has anyone seen a Memel medal in a case or envelope that actually has provenance ? 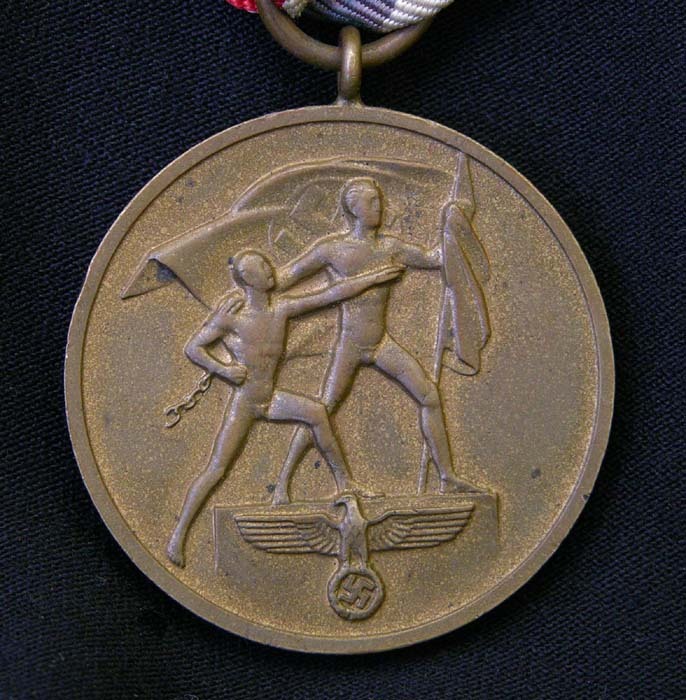 I have yet to see one that has any provenance with a case or envelope, and it is just too easy to put a medal in an Anschluss case. 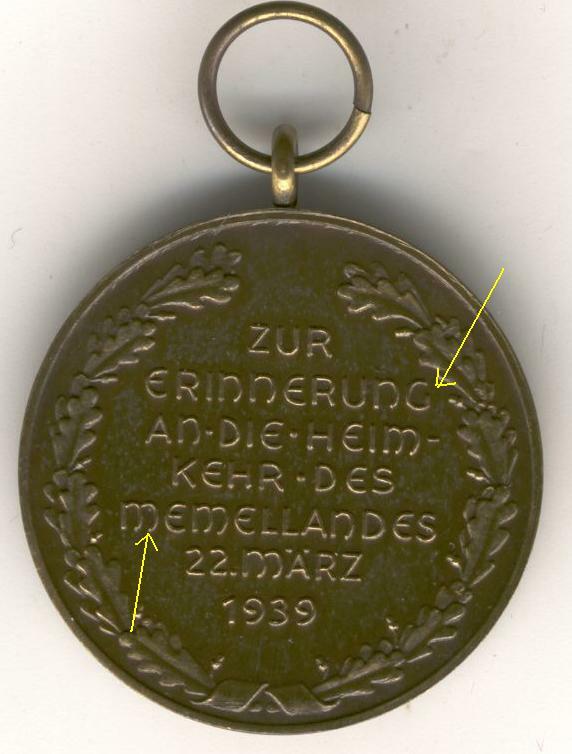 What dos a Memel Medal look like and what its for? I have not seen it in that configuration however I do have one on a bar for illustration...and one framed along with an award document both are bronze. The Memellandes were part of Lithuania and contained a large ethnic german population that Hitler decided should be made part of the Reich in keeping with his notion of "living space." 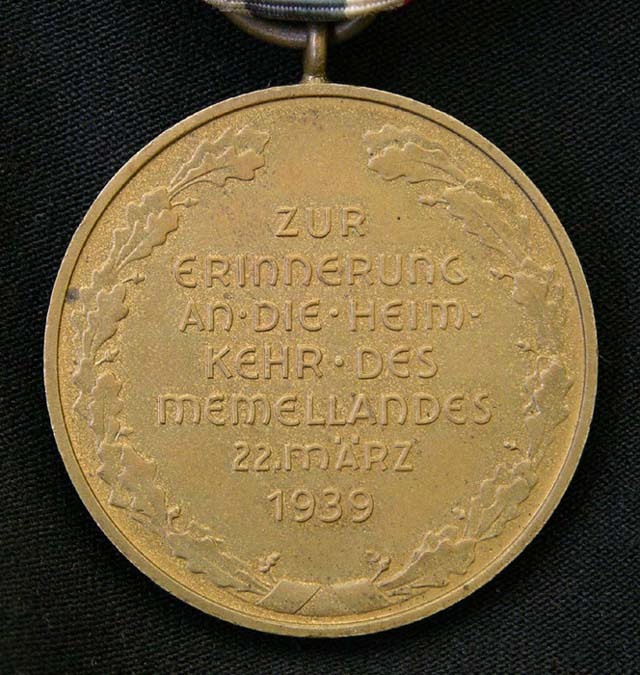 The Wehrmacht monitored the award of the Memel medal more closely than any of the other "flower wars" medals since cooks, clerks, butlers, chauffers and maids and sutlers had recieved the Austrian and Sudetenland medals. 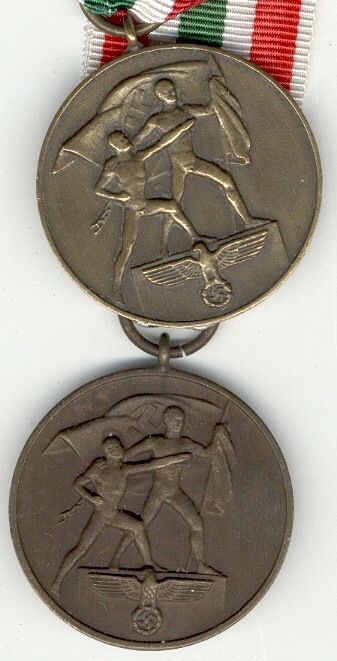 As you can see it is the typical naked Nazis with flags medal with a different date on the reverse. 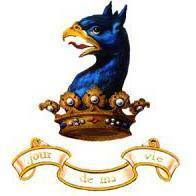 There has been a lot of debate on the ?Memel Medal?. 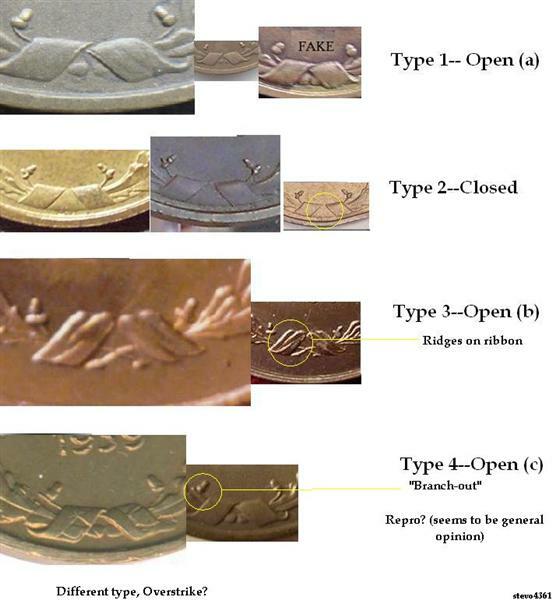 Due to its rarity, it has been heavily faked, some well done, some not so well done. The main point of contention seems to be with the type that leans away from the accepted type, the example with the small ?m?? I m o, There are original versions with large ?M?s?, but the fakers seem only to have copied this type, hence the difficulty? If you want to be absolutely sure of an original, choose the type shown with the smaller ?m? in the word ?M?RZ? Nice one. 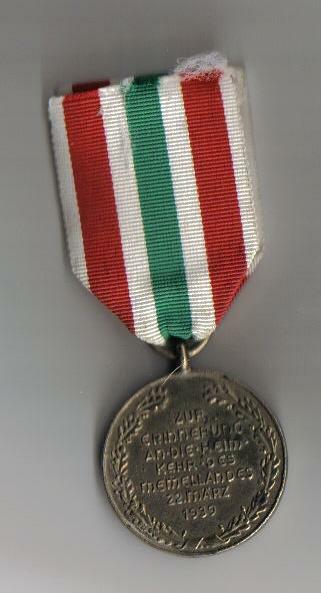 This Memel medal offers the most diverse collection of opinions bar none (other than maybe the Afrika Medal). I have also heard many say that the fakes have the vertical bottom part of the "G" in ERINNERUNG. The real have the slant part that angles up to the top left at a 45 degree angle (like yours). Following this hand in hand are the shape of the "m" s. The fakes they say are not very straight and tend to wrap more around and start to face towards the bottom left. See the below example ... what many feel are fake .. compared to yours, which many feel are the only originals. Could there have been two dies? I know that there have been a lot of threads in reference to this medal on MANY if not all related forums and websites. I am so very confused. In the case of these medals, I still have no idea what is good and what is not... even though I have read everything I can on them. I am posting the two that I have and ANY insight on them will be greatly appreciated. Thank you again... Please forgive my confusion on this topic! Thank you for looking and any comments are greatly welcomed! Reverse sides would help but we have discussed this medal before. Check out the search function for other comments. When I searched, I used the word Memelland. I read the thread and knew the information contained... it is just the longer I stare at these medals and what is on the sites/books the more they all look the same to me. I dont know what my hang up is with this medal and ID ing traits, but other than the "G" variations I cannot make heads or tails. Just thought I would throw this out there, I have seen 4 "versions" of the Memel, focusing on the bottom of the wreath, sorry for the "ad hoc" way it is thrown together, but it kinda demonstrates the different types. Thanks for all the people who posted their Memels on several forums as well, just giving credit where credit is due although I didn't keep track of whose are whose, sorry. 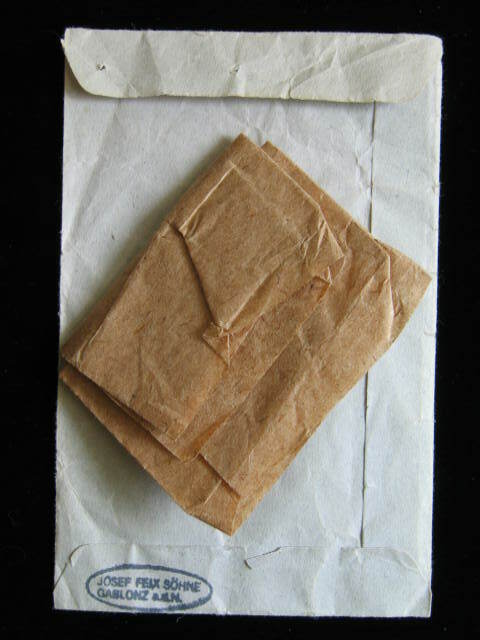 On the provenance of the cases/packets, I know of one with Mr. Marcus Hatton on WAF who has the Memel in a packet, which he recieved directly from a family member. And also, what do you guys think, more than 4 types? Thank you Steve! That was exactly what I was looking for! It seems as if my medals most closely resemember the one on the top row, on the left! I was going blind staring at "m"s and G's! This is my memel i bought when i first started collecting. any good, people? Here are some better scans. Thanks to Rick's help, I am finally getting the hang of this scanner!! The medals were accidently switched when I flipped them over. The one that was on the top in the last frame is now on the bottom. They both seem to be variations of type 1 listed above. I think we might have the same type. It is not one of those shown by Steve. Detlev sold one of these some time ago, maybe I can find the scan. Thank you for the reply! 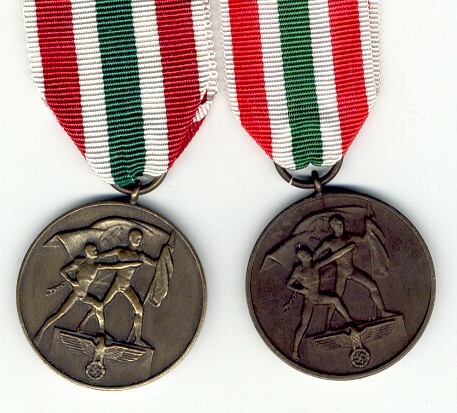 Our medals do look like they come from identical makers. I feel with all of my faith that they are real. Yes, I am convinced this one is real. Arh just saw this, I'll get back to this with some theory and thought on these packets of issue and the box idea's. And some pictures of course.